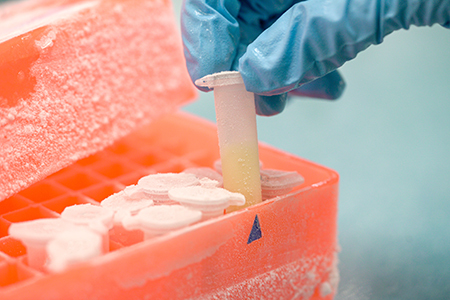 In the first part of this two-part article, common cryogenic shipping methods (dry ice shipping systems and liquid nitrogen (LN2) dry vapor shipping systems (Dewars) for gene therapy products were presented, and pros and cons of each method were discussed. In this part, major refrigerated transport methods of gene therapy intermediates such as apheresis material will be addressed. For both types of passive refrigerated shipping systems presented in this article, the product temperature within the package is maintained between 2°C and 8°C by applying the thermal physics of conduction, convection, and radiation, in conjunction with the latent heat of fusion from thermoregualtors such as phase change materials (PCMs) or cooling engines. These shipping systems include six insulated panels that are coupled with a cooling engine built into the lid. One of the features of the cooling engine system is an on-demand capability. The shipper is made ready for use by activating the cooling engine by pushing a button and placing the engine on the top of the shipper. The cooling transpires by releasing the flow of a small quantity of water within capillary channels in the lid and continuously evaporates water at low pressure. This shipping system reduces redundancies at apheresis collection sites because they do not require preconditioning of packaging components and have a simplified pack-out process. These systems do not use refrigerants or PCMs. Due to limited thermal source from the lid, this shipping system can maintain a temperature of 2–8°C for low to medium payload volumes up to 96 hours under extreme simulated conditions. These shipping systems cannot be reused, as the cooling engine is a single-use system and should be discarded after each use. As water is released in the lid within narrow capillary channels, the blockage of water path is possible leading to ineffective performance of the cooling engine in controlling the payload temperature. For this reason, there is a visual indicator on the lid demonstrating that the water is flowing freely inside the lid. Users are also advised to confirm the cooling action by touching the surface of the cooling engine near the button. These systems comprise an outer insulation medium equipped with rigid containers holding 2–8°C PCM. PCMs absorb and release thermal energy during the process of phase change, i.e., melting and freezing. The 2–8°C PCMs transfer a significant amount of energy in the form of latent heat at the melting point of the PCM, which is commonly 5°C. The 2–8°C PCM plates recharge as ambient temperature fluctuates above and below the PCM’s phase-change point, e.g., 3–7°C. In other words, when the ambient temperature is higher than that of the PCM, heat transfers from the surroundings to the payload, which creates a cooling effect and changes the PCM’s state from solid to liquid. When the ambient temperature is lower than that of the PCM, heat transfers from the PCM to the payload, generating a warming effect as PCM changes back to its solid state. Certain applications might require you to condition the PCMs as solid prior to shipment of apheresis material, while other will require the PCMs to be conditioned as liquid. The shape of the PCM containers also plays a significant role. The smaller the surface area and the larger the volume of PCM, the longer the PCM lasts at the phase-change stage. PCM shipping systems, unlike cooling engine systems, require preconditioning of PCM plates for at least 24 hours at either apheresis collection sites or 3PL (third-party logistics) companies. Pre-conditioning of the PCM systems at 3PLs would be the only viable option if the apheresis collection sites, for instance at community hospitals, do not have freezers or refrigerators to pre-condition the PCMs. PCM systems are preferred over cooling engine systems if a tight temperature tolerance (±1.5°C) is required. Some types of PCMs (e.g., organic, inorganic, eutectic, bio-based) deteriorate over the course of repeated freeze and thaw cycles, which affect their melting points and latent heat values. Hence, if reusability is a requirement, it is imperative that the thermal cycle test results are obtained from the manufacturer and evaluated for suitability. For systems that have PCM plates surrounding the payload box on all six sides, the thermal distribution is homogenous, and the shipper orientation is less important. In these systems, thermoregulation transpires from all surrounding sides of the payload. This is a major advantage over cooling engine systems, which only regulate the payload temperature from one side. Weight of payload efficiency (WPE), a ratio of PCM weight to payload weight under constant thermal performance, is significantly higher in PCM systems than in cooling engine systems. Unlike water-based cooling engine systems, which are comparatively safe for use, PCMs must meet safety requirements for toxicity, leak-proofing, biodegradability, and flammability. As with cryogenic shipping systems, most refrigerated transport systems are equipped with various sensors that can measure the air temperature, vibration, shock, and humidity and transmit data to a cloud database, providing surveillance capabilities and allowing end users to intervene as necessary. To accurately measure the apheresis temperature, additional electronic data logging monitors (EDLMs) may be used in close vicinity to the apheresis material, storing temperature readings at pre-determined time intervals. At minimum, all refrigerated and cryogenic shippers should be qualified thermally and mechanically. Ideally, prior to thermal qualification, simulated distribution (mechanical) qualification should be conducted to assess the effects of shock and vibration on leak-proofness of PCMs and cooling engines, the integrity of insulated panels (i.e., vacuum loss and air gap development between vacuum-insulated panels), and breakage or crack on primary packaging containing the material. Jasmin Baboo et al., The impact of varying cooling and thawing rates on the quality of cryoconvserved human peripheral blood T cells, Scientific Report, 9, 2019.